Welcome to Garden Bloggers’ Bloom Day for July 2010! Today’s featured flowers are new to my garden this year. I planted most of them either earlier this spring or late last year, well after last year’s July bloom day. 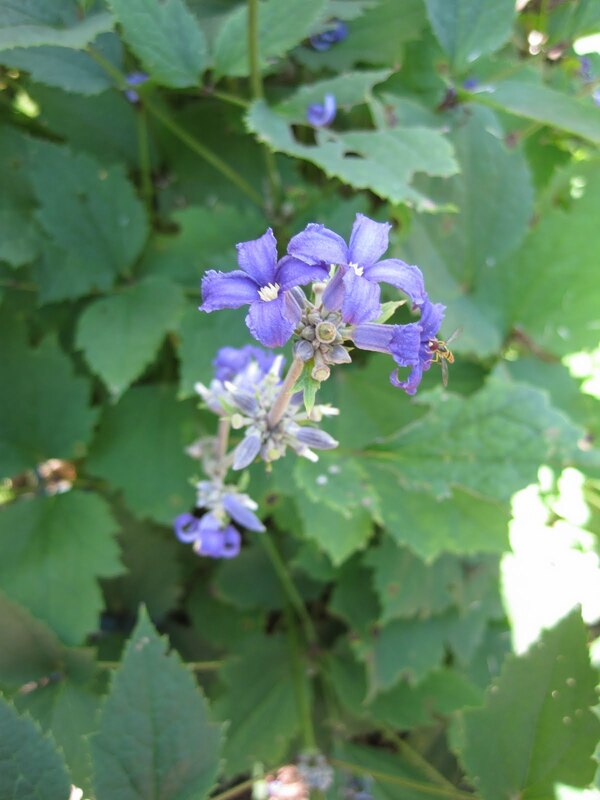 They include Clematis heracleifolia, with its tiny blue flowers. This shrub clematis is still in its nursery container, patiently waiting for me to find a long term home for it. And I will, before the snow flies. I’m also enjoying Calamintha nepeta subsp. nepeta. 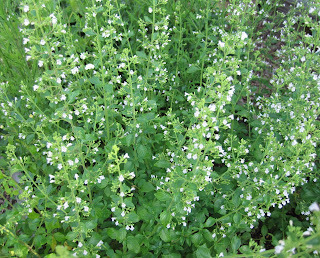 No one is going to make a big fuss over this calamint’s tiny white blooms, but they will or should make a fuss over the soft, minty fragrance. This one is bedded out in the vegetable garden waiting for a more permanent home in the new garden design. I can not resist touching it and smelling it every time I walk by it. 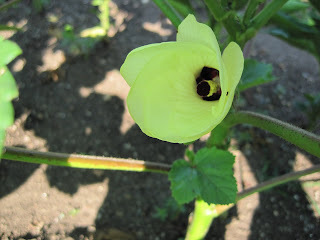 Also out in the vegetable garden, the okra is starting to flower. I’m just a tiny bit north of where okra would be happiest, but I’m trying it anyway. I’ve yet to harvest any okra, but I do think the flowers are pretty. Hey, how did that tomato picture end up on a bloom day post? I apologize, sometimes others (garden fairies) log on and mess with my posts. By the way, that’s my first ripe tomato, ‘Stupice’, right before I ate it. Anyway, I also have lots of coneflowers, tall phlox, lilies, daylilies, blackeyed susans, balloon flowers, hydrangeas, beautyberries, hairy alumroots, roses, panicum, and hostas blooming in my garden, including these mini hostas. Missing from the garden, thankfully, after several years of pulling it out are the false or ox-eye sunflowers, Heliopsis helianthoides, that seemed to be everywhere in 2007. 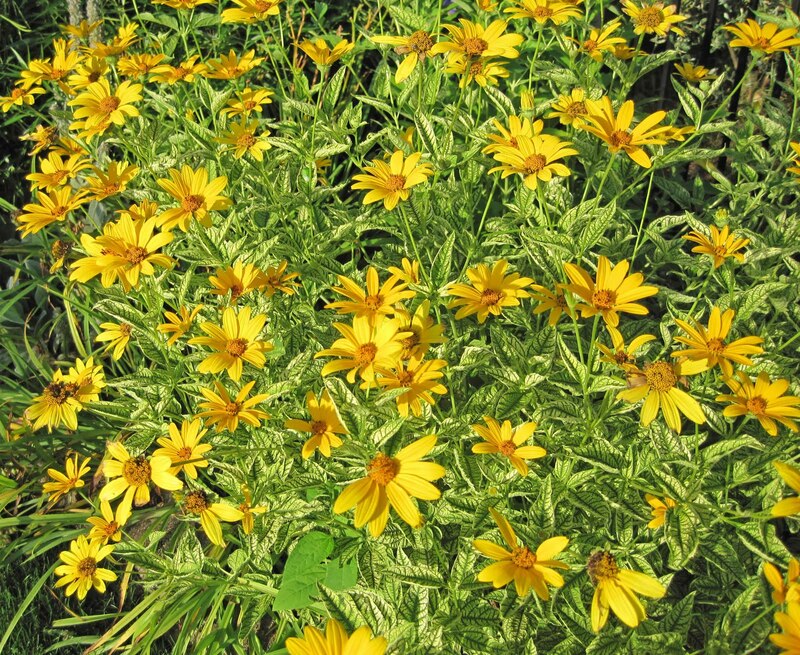 If I ever decide I want them again, I’ll just let the variegated Heliopsis ‘Loraine Sunshine’ sow herself all over the garden as she likes to do. Then I’ll have plenty for myself and anyone else who wants them. 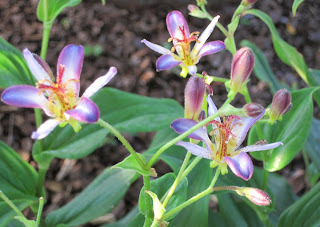 Finally, one of the surprises of the month is that at least one toad lily, Tricyrtis sp., is blooming. It really should be the last plant to flower in my garden in late September/early October. Every summer it seems like there is a flower that blooms ahead of its turn or well after its turn. In 2008, it was a white double-flowering columbine flowering rather late. And that’s why I like to keep this monthly record of what’s blooming in my garden, because it is never quite the same from year to year. I add new flowers and pull other flowers out, and the flowers themselves can sometimes bloom early or late. I have no control! We would love to have you join in for Garden Bloggers’ Bloom Day. It’s easy to participate and all are invited! Just post on your blog about what is blooming in your garden on the 15th of the month and put your name and the url to your post on the Mr. Linky widget below. Then leave a comment to tell us what you have waiting for us to see so we can pay you a virtual visit! Thanks again Carol for this wonderful opportunity! Love the toad lily and the okra flower, almost looks like a calla lily. thanks for hosting GBBD. so fun to see what everyone has going on in their gardens. Very cool Carol! I consider tomatoes to be Bloom Day worthy, after all they are the result of a bloom! What beautiful colors on your toad lily! Love the mini-hostas, Carol. And I envy you the first ripe tomato. Mine aren't there yet. You'll be doing your 'dance round the garden' with the pot of unusual clematis in your arms, trying to find a place for it. I think of that phrase each time I come home with an impulse buy from the garden centre. I didn't even know there were such a thing as mini-hosta's. Do they get eaten by mini-snails, I wonder. Love that okra blossom! Thanks as ever, Carol! Good morning Carol and happy GBBD. I think your toad lilies are so photogenic. I used to grow these in Ireland but where I now live they never come back after the winter. Your mini hostas look so cute! beautiful flowers--especially the toad lilies. congratulations on your first tomato of the season...i'm still impatiently waiting for mine. I like your okra bloom. You should have an okra real soon. Those hostas are mighty cute. I like that clematis, too. As far as the false sunflower, I have one regular one I'm letting grow, and have been pulling the others out one at a time so my husband doesn't notice as much, as this is the first flower I had to agree to plant (3 of) in order for him to agree for me to have a flower bed where the egress window had been dug out. The plants get so wilty when it's hot, but the one I'm letting grow is one I dug out of the vegetable garden, and it gets taller, and doesn't wilt so much. I have 2 variegated ones that I keep deadheaded as much as I can to avoid having to pull them out all over the place. Thanks for hosting GBBD. I have a bunch of photos of some of the plants that are blooming now. Can't believe you've got a tricyrtis blooming! Mine aren't but the autumn anemones are all budded up here, so it is a funny year. No apologies needed for hosta mini flaunting - very cute! Okra has blooms pretty enough to be grown for themselves and not the fruit. Carol, thanks for giving me the opportunity to take part in this interesting meme. Your hostas are very pretty and unusual. I have shown a few flowers which are blooming in my garden at the moment. I too went (mostly) for things that are new in my garden this year. I love clematis too and that's a type I haven't seen before. Aren't the first tomatoes so exciting? That is the taste of summer. Thanks for hosting GBBD, Carol. Happy Bloom Day! I enjoyed seeing your newest treasures and will be interested in seeing them featured in future posts, especially the shrub clematis. I love the mini hostas. I'm taking a trip to O'Brien's Hosta farm in CT later this month and may just have to pick up a few for myself. Sorry to post 2 links. I hadn't realized the Linky would auto fill in the link from last month, and there doesn't appear to be a way to remove the first link. I should have had my tea first! I forgot it was bloom day. I will have to get out there and take some photos. Your clematis shrub has some interesting blooms on it. I have never seen this before. Happy GBBD. 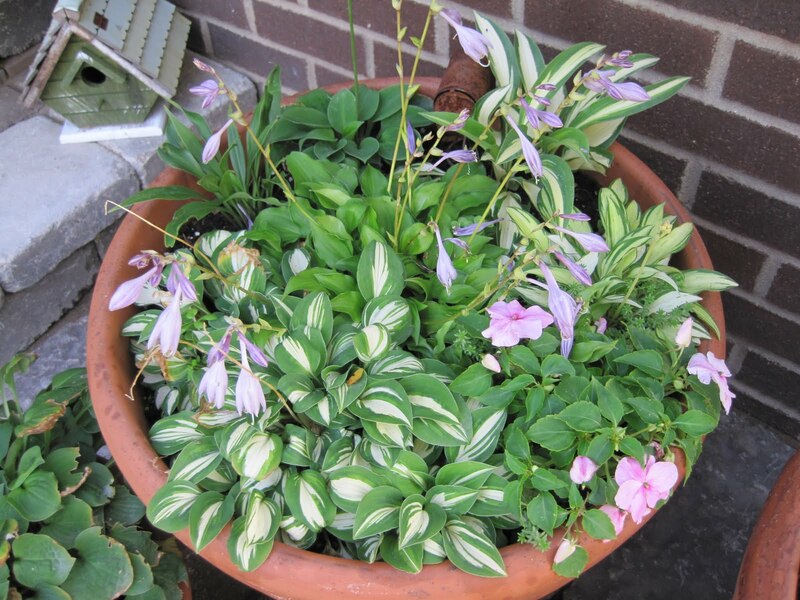 What a great idea to put the mini Hostas in a container. I only have two of them and they tend to get lost in the garden otherwise. I'm with Lisa; almost forgot it was Bloom Day — must be the heat! I'm glad you flaunted the mini hostas. It was a reminder that I could grow a few in a container and keep it on the piazza where there is some shade - and keep them away from the deer. I have raspberries ready to pick and one tomato is turning pink - but lots of new flowers. Love the mini hostas Carol! 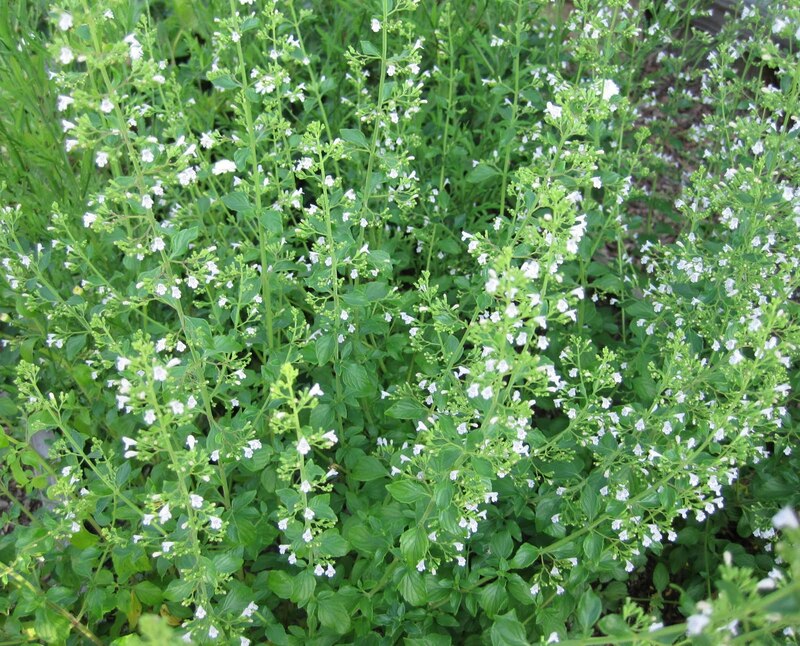 I'm a big fan of calamint, both the scent and the sweet, airy blooms. They're tiny and not particularly showy, but make a wonderful textural contrast with so many other, larger blooms. And the well-behaved, beautifully shaped, shrubby form is really nice. Hi Carol! I really like your veggies and the toad lily! Great July blooms! Thanks for hosting this again this month. 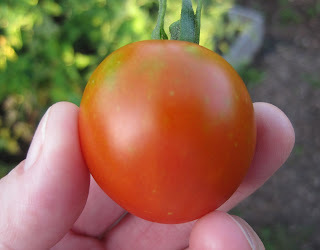 Carol, I am so glad you posted your yummy tomato because my Bloom Day post features my vegetable garden. I didn't know about mini hostas - now I want some! The rabbits ate my toad lily ... yours is lovely! The okra blossom is very pretty. I love the toad lily too. I never thought much about mini Hostas, I have a tiny white one with green edges that seems to be forgotten and unappreciated in the garden. I am planning to add to a shade garden along a path weaving through the woodlands where the children have made their faerie houses, perhaps mini hostas would be the perfect plants near their houses. Thanks for hosting bloom day Carol. I bet your garden was very happy to have you back and get some attention. Love the toad lily and the okra flower is pretty too. I'm afraid I have no love for okra so I don't think that bloom will be found in my garden-although I saw some dried okra yesterday and that did look interesting. I love the shrub Clematis - must find one of those for my garden as all my shade along the fence was lost in a storm the first of June. Thank you for hosting these bloomers each month. I am glad to see that someone else appreciates the ornamental qualities of Okra. I like the look of the foliage and structure as well. Thank you for again hosting GBBD and have a great day! I have never seen the false sunflowers with the variegated leaves. What a fun plant. I am joining you for the first time. Thank you for hosting. Thanks Carol for showing us what is new in your garden. The trout lily is beautiful. I have plants still in pots too waiting for me to finally decide where to put them. I almost forgot that it was Garden Bloggers Bloom Day. What an air head. Thank you Carol for hosting Garden Bloggers Bloom Day - what fun! Who would have thought that Okra had such a great looking flower! I do not have any ripe tomatoes yet. I can't say I have a whole lot of *new* blooms this year, but my perennials are definitely ahead of last year's. Might have something to do with it being warm and wet rather than dry and cool! But the garden is looking pretty festive here at the midpoint of a Chicago summer. The okra blossom is beautiful. And I love that you host this monthly journal of what's blooming around the world! Thanks. Thank You for doing the Bloggers Bloom Day. What fun. This is my first time joining in on the GBBD-july2010. And I love your blog. Now I'm off to visit other garden blogs. Love the Clematis, it's so charming. One of my favorite botanical names to say is "Calamintha nepeta nepeta," It reminds me of a P.G. Wodehouse character name. I think you should leave the Impatiens in the mini Hosta pot. It's a nice contrast to the Hosta blooms. Every Bloom Day is different. Garden is hot and dry here but I found blossoms. You should have okra pods soon. Okra loves hot weather. Okra is very tasty in vegetable soup (gumbo). Mr. Linky would not allow me to enter my URL, but my Bloom Day post is up @ http://gardeningwithnature.blogspot.com/2010/07/garden-bloggers-bloom-day-july-2010.html. Thanks for hosting Bloom Day once again. So many wonderful gardens! I left the wrong link on #34 (I just clicked on it and it was the June post)...so now I added the right one for July on #57. Thanks for hosting, Carol. My GBBD post is now up. I am in okra-growing territory but haven't tried to grow it and had no idea how beautiful its flowers were! Your garden sounds super lush and fragrant. That tomato looks mighty tasty! And you are quite clever to pot your mini Hosta collection together like that, I love it! Happy bloomday and thank you for hosting! We've seen a lot of things come and go early this year, I think, Carol. Hope your toad lily comes back to visit in fall, as it's supposed to! Happy blooms day, and thanks as always for being our town square. Wonderful photos, I'm very jealous of your Toad Lilies, I planted a few earlier in the year and two began to come up but seem to have given up! It is hot and very humid here among the leaves (and blooms) today. I love sharing with my fellow bloggers. Thanks for the opportunity. That heracl. clematis was once a strong, easy plant for me but never again. Mine struggles, yours gives me hope. Calamints are very fuss-worthy. I need some of those again too. I thought I posted earlier, don't see it. Thanks again, and happy bloom day! Your toad lilies, my blue plumbago... even my Japanese anemones are in bud already! Are we going to have anything left for GBBD September?!?! Love those okra flowers, though. And do you bring your hosta containers inside the garage or something for the winter, or just leave them? I have a huge pot of 'Blue Mouse Ears' that is, like your clematis, waiting for a permanent home. I just heeled it in last winter. 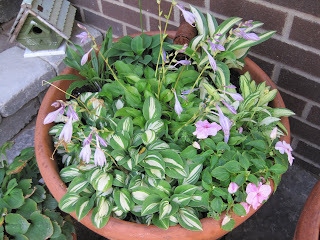 Love the mini hostas - they sure look different all tiny and arranged in a container. Also love that Okra - hope it produces, but if not, what a unique flower! The okra flower is really pretty! How lucky to have a tomato already, we still only have flowers on our plants. The mini Hostas are really pretty in the container, great idea! We don't have our own garden but were wowed by blooms in northern Massachusetts last month. Okra! What the heck is okra? Here in the Pacific NW we can grow a lot of stuff, but okra (and watermelons) are definitely not on the list. What a lovely tomato and those minature hostas are something I need to investigate. Thanks again for sharing. Whoops! I made a second entry, because I accidently linked to last month's Bloom Day post the first time, instead of today's. Hope the second time is okay! I have okra in my post too! I think it's one of the prettiest flowers out there, veggie or non-veggie. And wow, toad lilies - that is early! Lovely. Who knew okra had such a pretty flower? Oh, for a fresh-out-of-the-garden-tomato! You, lucky thing! It looks like a little bit of heaven and should certainly be included in Bloom Day. I'd be leaving that impatien in with those cute hostas. The soft pink adds to those pretty leaves. I have several potted plants waiting for homes. Isn't that a perfectly normal condition for "enthusiastic" (obsessive) gardeners? Thanks for hosting once again, Carol. Flying in in a frenzy from The Havens today. LOTS going on, must fly -- have to go pick plums. I am EXTREMELY JEALOUS of the fact that you have a ripe tomato, all of mine are stubbornly green but there is a lot of fruit set. So there is still hope. I adore your mini hostas. I have planted and lost many of them here at The Havens, they heave out of the ground terribly during the winters. I am just inspired enough to perhaps try a few again. The nursery guy I talked to said I need to mulch them heavily for winter to protect them from heaving. Looks like containers work pretty well too, judging by your beauties. Personally, I'd let the impatiens stay, but that is just me and my wild side. Thanks for hosting us once again, Carol! I need a toad lily!! Lovely! What a wonderful idea! My garden is sadly lacking in blooms today but I wanted to share these beautiful hummingbirds! I like the new look of your blog, but are you teasing us with that blank spot that says "my picture here"? No picture, just a verbal promise. The flowers of okra are excuse enough to grow the plant, even if one doesn't like to eat the fruit. That is a delicate and very pretty shrub Clematis Carol. They look charming in the pot all together. Oh, but I like the impatien and it looks so lovely with the hostas. My July posting is up. Last year my toad lilies started blooming early just like yours is doing now. So far though, no blooms on mine early this year. Tired and heading to bed, but wanted to post Garden Bloggers' Bloom Day first. One of the cool things about this activity is that it gives me a record of what's going on in the garden that I can compare year-to-year. Unlike Carol, I do not keep a garden diary. Just must lack the discipline. Thank you Carol :) I read all about your trip to Buffalo and was green with envy! I am beginning to save now because it is my dream to attend next years conference with you wonderful garden bloggers! I have so much to learn!! That okra is so gorgeous, it'd be worth growing for the flowers alone! Your Toad Lily is a lovely surprise:) Happy Bloom Day! I love your little container planting, and your okra flower. Happy GBBD! Mini-hosta?! I've never heard of such a thing. What will they think of next. I've seen a lot of GBBD's at some of my favorite garden blog sites, so thought I would join the bunch. What fun! Thanks for dreaming up this idea. I love your hoe collection. Bad Garden Joke: Why do gardeners like Santa Claus? Answer: Because he says Ho,Ho,Ho. Carol, thank you for hosting Bloom Day! The okra flower is lovely. And your tricyrtis reminds me of my mother, who dearly loved them. I so enjoy seeing your garden in bloom! Man, now I'm regretting the fact that I didn't grow okra again this year! Beautiful pics as always! Those mini hostas are just way too cute! Pretty! another beautiful bloom day! Thanks Carol. I did not forget. Going back to work and this horrible internet in the wilderness just slowed me down. My shrub like Clematis stans are blooming for the first time this year. Oops - sorry Carol! Got so hung up on making both a bloom & a tomato post that I forgot to leave a comment... and the shrub clematis, okra and tomato certainly deserve compliments! So does the Toad Lily... even if the plant is singing September Song in July. Your plant list sounds pretty cool, too, but sure wish someone would come up with a better name than Hairy Alumroot. That sounds like an old, used styptic pencil with bits of beard stuck to it. I'm probably way too late, but I put a link in anyway. My two older kids and I are in a musical that opens on Thursday so this morning was the only time I had off to put a photo post together! Love your tomato but can assure you that *this* garden faerie does not mess with your posts. Much.